A seed is a part of a flowering plant involved in reproduction. It consists of three major parts: the embryo, endosperm, and testa. The embryo is produced when male and female elements are combined during reproduction. It will eventually grow into a new plant. The endosperm is a collection of stored food the young plant will use as it begins to germinate, or grow. The testa is a tough outer layer that protects the embryo and endosperm from damage by outside factors. Two kinds of seed plants exist. Gymnosperms are plants that produce naked seeds. The most common type of gymnosperms are conifers, cone-bearing trees and shrubs such as firs, hemlocks, junipers, larches, pines, and spruce. Angiosperms are plants whose seeds are enclosed in a protective structure called the fruit. Angiosperms are also known as flowering plants because they produce flowers in which seeds are produced and in which they develop. Seeds are produced when pollen is released from the male (stamen) part of a plant. That pollen comes into contact with the ovules of the female (pistil) parts of a plant. Some kinds of plants contain both male and female organs on the same plant. In that case, self-fertilization can occur when pollen from one part of the plant fertilizes ovules on another part of the same plant. In most plants, fertilization occurs between two different plants, one of which contains only male flowers and the other only female flowers. This process requires some kind of mechanism by which pollen can be carried between plants. In some cases, movement of air (wind) can bring about this kind of fertilization. Insects and birds can also produce the same result. For example, a bee may visit a male plant in search of nectar. In that search, the bee may rub off pollen onto its body. When the bee then visits a female plant, it may release that pollen onto the ovules of the second plant, making fertilization possible. The endosperm within a seed is used when the embryo begins to develop. Seeds vary widely in terms of the relative amounts of embryo and endosperm they may contain. For example, members of the orchid family have tiny, dustlike seeds that consist of little more than core embryonic tissues, with very little in the way of energy reserves. In contrast, the gigantic seeds of some coconuts can weigh more than 60 pounds (25 kilograms), most of which is nutritional reserve surrounded by fibrous, protective husk. Angiosperm: A plant whose seeds are enclosed in a protective structure called the fruit. Dispersal: Any process by which seeds are spread outward from their parent plant. Dormancy: A state of inactivity in an organism. Embryo: The young form of an organism. Endosperm: A collection of stored food used by a young plant during germination. Germination: The beginning of growth of a seed. Gymnosperm: A plant that produces naked seeds. Pistil: The female reproductive organ in a plant. Pollination: The transfer of pollen from the male organ of a plant to the female organ. Self-fertilization: The process in which pollen from one part of a plant fertilizes ovules on another part of the same plant. Stamen: The male reproductive organ in a plant. Testa: A tough outer layer that protects the embryo and endosperm of a seed from damage. A seed exists in a dormant (sleeping) state. It begins to germinate, or grow, only when it is deposited in a favorable environment, such as moist, warm ground. The long process by which a seed changes from a tiny embryo into a fully grown plant requires time and favorable conditions. In most cases, young plants have a better chance to survive and grow if they are deposited at some distance from the parent plant. In those cases, they will not have to compete for sunlight, water, and nutrients with their own parents. There are, however, some important exceptions to this general rule. For example, the adults of annual species of plants die at the end of their breeding season. In those cases the parent plants do not compete with their seeds. Nevertheless, even annual plants tend to disperse their seeds widely. Methods of dispersal. 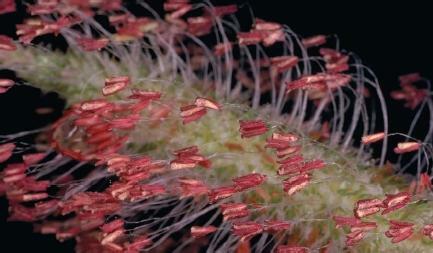 Plants have evolved a variety of mechanisms to disperse their seeds effectively. In some plant species, seeds are very buoyant, so they can be dispersed over great distances by the winds. Some well-known examples of this kind of plant are the fluffy seeds of the dandelion and fireweed. The seeds of maple trees are also dispersed by the wind. These seeds have a one-sided wing that causes them to swirl propeller-like after they are released from a parent tree. This structure allows maple seeds to be carried by even light breezes some distance from their parent before they hit the ground. Some plants have developed an interesting method of dispersal, known as tumbleweeding. These plants grow into a roughly spherical shape. After the seeds are ripe, the mature plant detaches from the ground surface and is then blown about by the wind, shedding its seeds widely as it tumbles along. The seeds of many other species of plants are dispersed by animals. Some seeds have structures that allow them to attach to the fur or feathers of passing animals, who then carry the seeds some distance away from the parent plant before they are deposited to the ground. One example of this mechanism is burdock, whose spherical fruits have numerous hairs with tiny hooked tips that stick to fur. This fruit also sticks to human clothing, and was the botanical model that inspired the invention of Velcro™, a sticky, synthetic fastening material. Another mechanism by which seeds are dispersed by animals involves their encasement in a fleshy, edible fruit. Such fruits are often brightly colored, have pleasant odors, and are nutritious and attractive to herbivorous (plant-eating) animals. These animals eat the fruit, seeds and all. After the fruit passes through the animal's digestive system, the seeds are dispersed at some distance from the parent plant. The seeds of many plants with this sort of animal-dispersal strategy actually require passage through the gut of an animal before they will germinate. Some familiar examples of species that develop animal-dispersed fruits include the cherries, tomatoes, and watermelon. After seeds have been dispersed into the environment, they may remain in a dormant state for some time, until appropriate cues are sensed for germination. Such clues include sufficient water, oxygen, and an appropriate temperature. Interestingly enough, the seeds of many species will not germinate even under favorable conditions. For example, seeds produced and dispersed just before the beginning of a cold season might actually experience the right conditions for germination for a short period of time. However, they would probably not survive if they germinated at once. A period of dormancy enables the seeds to wait out the cold season, and to begin growth when conditions are more favorable for the mature plant, in the springtime. It allows seeds a better chance of surviving unfavorable conditions and developing successfully into plants. time. Soon afterward, the embryonic root emerges from the seed and begins to grow down into the soil. At about this time the shoot also emerges and grows upward out of the soil. Seeds are used by humans for a number of purposes. The most important of those uses are as foods. Some seeds are eaten directly, while other are used to manufacture flour, starch, oil, alcohol, or some other edible products. Some examples of such seeds include those of wheat, rice, maize, sorghum, barley, peanut, soybean, lentil, common pea, common bean, coconut, walnut, pecan, and sunflower. Many other seeds are eaten with their fruits, although it is generally the encasing fruit walls that are the sought-after source of nutrition. A few examples of edible fruits include those of the pumpkin or squash, bell pepper, apple, sweet cherry, strawberry, raspberry, and sweet orange. What Plants use Seed Dispersal? What are thenames of them!!! the name of the process where seeds are spread out away from parent plant is dispersion.